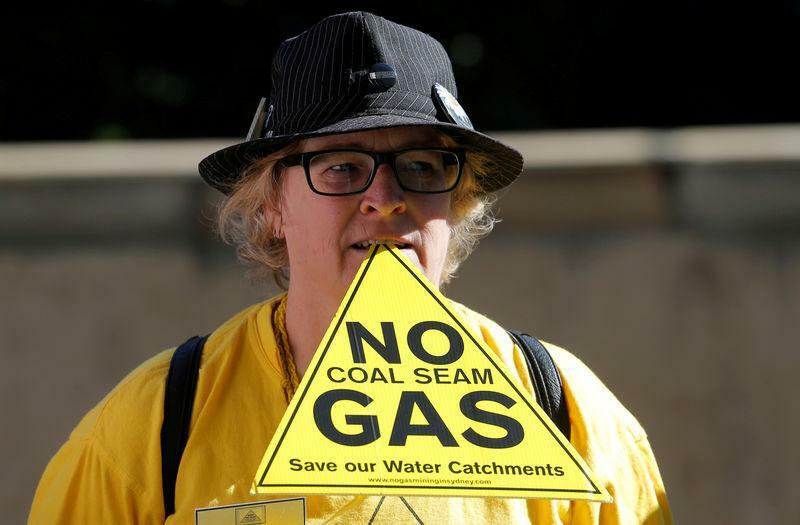 MELBOURNE (Reuters) - A $2 billion (£1.5 billion) coal seam gas project that could ease a looming gas shortage in eastern Australia is at risk of becoming a casualty in a weekend election in the country's most populous state. The Narrabri project, owned by Santos Ltd, could supply up to half of New South Wales' gas needs and help ease soaring energy prices, but has faced fierce opposition from farmers and green groups in a campaign that has resonated widely, particularly in key Sydney city electorates. A failure to proceed will offer a fillip to rival schemes to import liquefied natural gas (LNG), but unions and industry say this won't do enough to lower energy costs and save jobs in manufacturing. "Without an affordable supply of gas it is no exaggeration to say that tens of thousands of jobs could be lost across New South Wales," Australian Workers Union National Secretary Daniel Walton told Reuters. Wary of a potential gas shortage in the 2020s, the conservative Coalition state government has allowed the project, situated in a state forest 520 km (320 miles) northwest of Sydney, to undergo an independent planning review. However opposition Labor - running neck and neck in polls - has vowed to kill it off, saying Narrabri poses an unacceptable risk to water for farming and indigenous communities. Farmers are worried coal seam fracking will damage their water supply. The process involves extracting gas from rock by cracking it with water and chemicals at high pressure and is banned or limited in most Australian states. The stance of state Labor leader Michael Daly ignores the pleas of unions, a core Labor support base, while even the ruling Liberal/National government has shown only lukewarm support, given the potential political fallout. Manufacturers, however, are dealing with a tripling of gas prices since 2015 due to the start-up of three east coast LNG export plants that have sent much of the country's gas offshore. Polymers maker Qenos Chief Executive Stephen Bell said gas prices would have to be around A$6 to A$8 (£3.2 to £4.3) a gigajoule for his business to remain competitive, compared with market offers now at A$11 to A$15. "We've got a situation that's now quite difficult. These prices are not sustainable," Bell said. The alternative to Narrabri lies in plans to build up to two LNG import plants in the state, but critics say these would supply gas at international prices, well above the cost of local coal seam gas. "I haven't been able to see a way that LNG imports will deliver the pricing we need," said Bell. Looking to shore up support for Narrabri, project owner Santos signed a tentative gas supply deal last month at a proposed ammonium nitrate plant, touting it would create local jobs. Analysts said it was hard to predict the project's future. "It's tricky because of the environmental challenges and local resistance," said Chris Meredith, an analyst at consultants Wood Mackenzie. Santos is counting on the state approval process to remain independent in the hands of the planning regulator. "There is no place for politics," Chief Executive Kevin Gallagher said in emailed comments, adding that imported gas would lead to higher prices or shortages, particularly when LNG demand in Asia is high. "It is a certain way of ensuring that at some time in the future foreign suppliers would have a gun to the head of Australian manufacturers," he said.